Guts is the protagonist of the story. He is a tall, muscular man with a huge sword called the Dragon Slayer, a prosthetic left forearm that has a magnetic grip which also conceals a cannon. Guts is a tragic hero; he is born as one who may be able to struggle against Causality, but seemingly unable to affect it on a large scale. 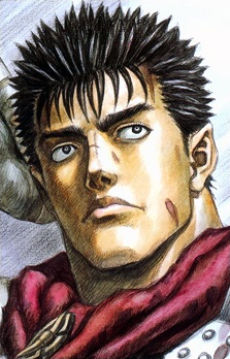 His name has often times been translated by some English scanlation groups as "Gatts", or "Gutts", or "Gattsu". However, the official translation provided to Dark Horse Comics by Kentaro Miura himself is in fact "Guts".